Photo: MCB dancer Natalia Arja; photo © Sasha Iziliaev. For original article published in Artburst (April 2016) click here. New Yorkers were still dressed for winter in somber coats and dark sweaters as a mixed crowd from socialite types to teenagers with backpacks filed into the red velvet jewel box for the Joyce Theater’s Saturday, April 16 evening performance of Miami City Ballet’s 2016 Lincoln Center debut. The chill dispersed even before the curtain rose in the excitement shared by frequent ballet-goers like Michael Arnoldson and his partner, David. The evening’s line-up included two New York debuts by Justin Peck and Liam Scarlett, choreographers who both call the city at least a part-time home; and for New Yorkers like Arnoldson this would be his first chance to see the critically acclaimed ballets the two choreographers had created for the Miami company – Peck’s Heatscape and Scarlett’s Viscera. 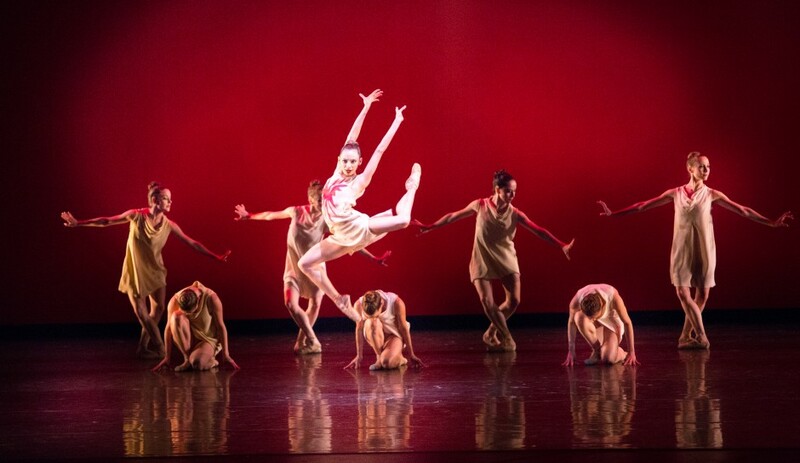 The curtain opened on Heatscape and a line of 17 dancers dressed in simple white and beige seated at the front of the stage, framed by Shepard Fairey’s gorgeous red and fuchsia mandala as backdrop. For a moment, the motionless dancers allowed the audience to fix attention on the scrim and take in the bright opening of Bohuslav Martinu’s Concerto No 1 for Piano and Orchestra. Then, just as Francisco Rennó struck the piano solo’s first chords, Renan Cedeiro sprang into an acrobatic sequence of pivots, turns, and leaps, his long arms and legs fused with Rennó’s phrasing. In Heatscape images present and intensify and then vanish as, for instance, when Cedeiro and Emily Bromberg lock eyes across the stage early in the first movement — erased at once as Bromberg disappears when the seated company stands and faces Cedeiro. Moments later Cedeiro anchors three women in deep arabesques penchées in a reference to Balanchine’s Apollo that again vanishes as the stage resolves into just Bromberg and Cedeiro, facing one another and alone at last to begin their pas de deux. If Martinu’s Concerto sounds like phonic laughter, the night’s second piece — Liam Scarlett’s Viscera set to Lowell Liebermann’s Piano Concerto No. 1 — triggers serious gritting of teeth with the suspense of strings and piano in passages seemingly lifted from horror movie soundtracks. The ballet itself is visually dark. The backdrop transitions slowly through deep purple to slate blue and scarlet. Dancers in deep burgundy leotards materialize and disappear in the half-light as if moving through a miasma. The darkness flattens the individuality of the dancers and makes them seem parts of a single body (hence the ballet’s name), though in the first movement the astonishing extension of Renato Penteado and Jeanette Delgado through arms, shoulders, and upper body were sure signatures of their presence on stage. Despite a fall taken by a dancer in the first movement, Viscera’s second movement, danced by Carlos Miguel Guerra and Jennifer Carlynn Kronenberg, was one of the highlights of Miami City Ballet’s entire season. Kronenberg’s leotard left her arms and legs uncovered, and on the dark stage her bare skin shone surreally white. Guerra, in a full-body dark purple leotard, was often nearly invisible and so tactful in his support of Kronenberg that she seemed to float unaided. In one passage, Guerra wrapped his arms around her waist from behind and waited, nearly invisible, until Kronenberg’s legs, drawn up tight against her body, suddenly fanned open like a startled, strange sea creature anchored against coral. After the suspense of Viscera, Balanchine’s Bourrée Fantasque made it okay to breath – and laugh. The first movement opened to a stage framed floor-to-ceiling with dark-blue velvet curtains, sapphire scrim, and men in black tights and deep-blue vests complementing the women, elegant in black tutus and corsets. The music of Emmanuel Chabrier’s Bourrée Fantasque capped off a night for solo piano that pit piccolo against piano and teased in riffs from the can-can. In the comic first movement, the much taller Jordan-Elizabeth Long towered above the slight Shimon Ito, nearly lifting him off his feet as he fought to keep up. When with an imperious snap of a black fan she finally paused, it was all he could do to wrap his arms around her waist and stare up anxiously, catching his breath before the next round began. The piece ended with much of the theater out of their seats and cries of brava, bravo, and bravi that continued for at least 20 minutes. The warmth and excited energy of the New Yorkers recalled to this reviewer’s mind the deservedly ecstatic reception Paris audiences had given the company during their performances at the Théâtre du Châtelet in 2011. If the success of their Lincoln Center debut carries the momentum it should, Miami City Ballet will join the rest of the snowbirds heading North in the Spring for years to come.